The popular 1997 animated film has been transformed into a visually sumptuous stage version. Of course, like the film, any relation to the actual Romanov Grand Duchess Anastasia who was slaughtered at the age of 17 with her father Czar Nicholas II and the rest of her family in 1918, is strictly coincidental. This is pure fantasy. 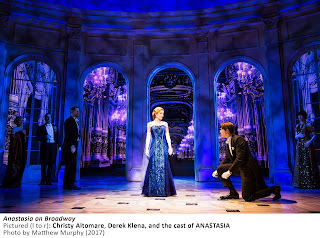 In this telling, however, two con men, Dmitry (Derek Klena) and Vlad (John Bolton), a former nobleman, find a young woman Anya (Christy Altomare) to impersonate the murdered girl, as rumors are rife that she had, in fact, escaped. 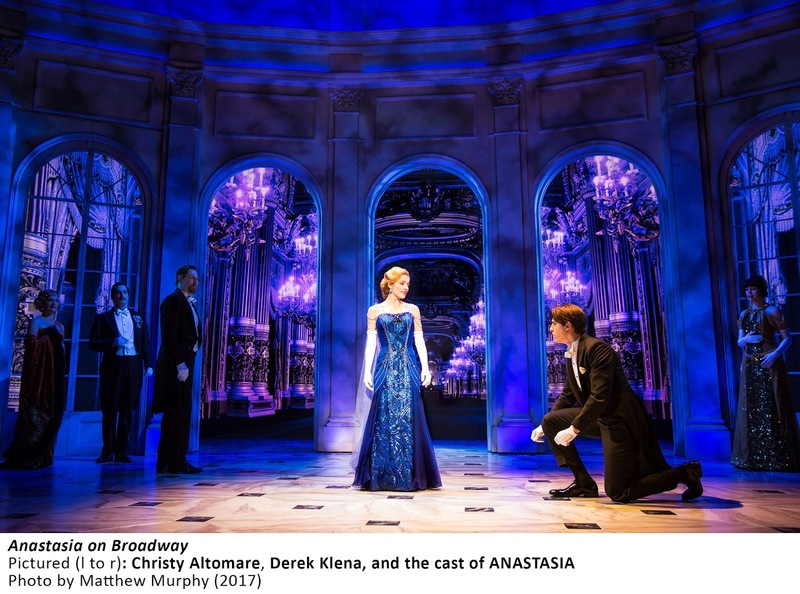 Under their tutelage, young Anya comes to believe she may really be Anastasia, and must then, in Paris, convince her grandmother, the Dowager Empress (Mary Beth Peil), of that fact, while Dmitry and Vlad hope to collect the reward for finding her. Meanwhile, Anya is being pursued by a Russian secret police officer Gleb (Ramin Karimloo) determined to drag her back to Russia or else kill her. The score, by the estimable team of Stephen Flaherty and Lynn Ahrens, has been generously expanded from the movie, and the script is by Terrence McNally, no less. But despite their generally worthy contributions, the most striking aspects of the production are the beautiful scenic design (by Alexander Dodge) the eye-popping projections (by Aaron Rhyne) which provide endless scenic backgrounds for the various scenes (St. Petersburg, Paris, elegant ballrooms, an opera house), and the costumes (by Linda Cho) which are truly gorgeous. The projections are mostly stationary, like real scenery, but the trio’s escape from Russia on a moving train provides a genuinely cinematic experience as the backdrop shows us the scenery whizzing by. Altomare has a powerful set of pipes and an appealingly spunky disposition. Klena is boyishly appealing, and also sings well. In writing the book, McNally has reunited with his “Ragtime” collaborators Ahrens and Flaherty, and wisely has dispensed with the cartoonish depiction of Rasputin who, in the film, is a magical demon pursuing the supposed royal to Paris. In its place, McNally has the Gleb character, ultimately not quite a villain but not a hero either, despite the casting of matinee idol Karimloo. Rasputin, of course, had in actuality died well before Anastasia and her family did. And it has since been forensically proven that Anastasia did indeed perish with the rest of her family. Still, taken as a fairy tale, the story is effective, as was the live action film with Ingrid Bergman in 1956. 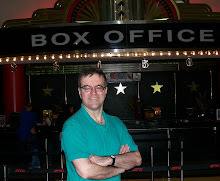 The six movie songs, including “Once Upon a December” and “Journey to the Past” work well on stage -- the film, like Disney’s “Beauty and the Beast,” always had a Broadway-sounding score -- so that's no surprise. There are some attractive new pieces, too. Darko Tresnjak directs with appropriately epic sweep, and the dramatic scenes are well judged. The tween girls who love the movie enthusiastically greet each of the familiar songs and seem totally smitten with the romantic elements. But I must admit the adults in the audience were just as attentive.